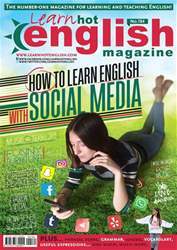 Digital Subscriptions > Learn Hot English > 184 > Listening activity!How to do a job interview presentation! • What qualifications have you got? • Tell me a bit about your experience. Etc. You’re going to listen to someone who is giving a job interview presentation. Instead of a typical interview with the interviewer asking questions, the candidate gives a presentation. Interviewers often ask interviewees to do this to see what their presentation skills are like. Listen once. Were any of the questions or statements you thought of for the Pre-listening activity mentioned?